Everyone can earn a degree, no exceptions. You don't need to leave home. All courses are live on the internet. "Welcome. I will try to explain Apostolic Theological Seminary on one page. Please email or call with further questions." Most of the professors are licensed by the UPCI. The Kleins are licensed by the UPCI. ​ ATS is very, very different from all other campus and distance learning seminaries!!!!!! - One of the ways in which we are different is we teach Biblical Greek, O.T. & N.T. Aramaic, and Hebrew. - The cost of courses is inexpensive. financial needs.​ Graduate without heavy DEBT! Payment plans are available. Can you afford $100. a month? - Undergraduate degrees are accepted from all Apostolic colleges; a transfer degree is not required. Sister Natanyah Hayles, Dr. Bruce Klein. and the Biblical language study courses. - Learn what is not taught in Bible colleges and seminaries! - The seminary's goal is to teach deep spiritual truths - the 'tough meat' of the WORD! ​ Our purpose is to Biblically educate pastors, Bible teachers, missionaries, apostles, prophets, prophetesses, evangelists, and you. If you are seeking solid Biblical knowledge, Apostolic Theological Seminary is the school for you! The mission of Apostolic Theological Seminary is to prepare Christians for the ministry of exegetical and expository preaching and teaching of the Word of God, for effective and spiritually mature leadership. Bachelor's degree or a Master's degree? When Dr. Klein was a student at Grand Rapids Baptist Seminary, a student 30 years of age or older could earn a Masters degree without undergraduate credits. Grand Rapids Baptist Seminary is a fully accredited, government recognized seminary. Anderson School of Theology (Anderson, Indiana) as well as many other seminaries accept students without college credit. Apostolic Theological Seminary admits students into the graduate program the same way. 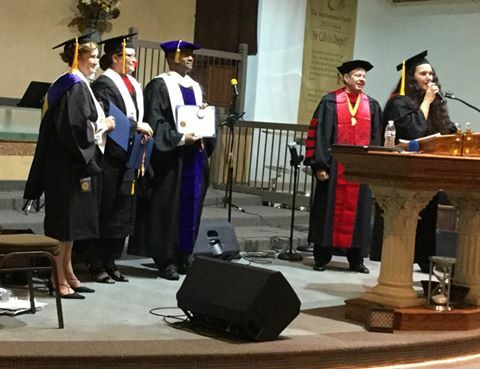 To be admitted into the Master of Arts in Biblical Studies degree program, a student 25 years of age or older does not need a bachelor's degree or college credits. ATS is not a diploma mill. All students must learn the material. Honorary degrees are not awarded. Preterism and soul sleep are not acceptable doctrines. A student can be declined admittance for any reason. Those who believe in Pre-trib, Mid-trib, Pre-wrath, and Post-trib are graduated. A student many times studies from the books the professors have written; he or she is taught by live online class (webinars) through each course. ATS is a distance learning school. All degrees are totally completed by distance learning. An overseas student can study the same way. He or she needs to be able to use a computer connecting to the seminary's webinar site for one hour lectures. Dr. and Sister Klein have published over 26 books. Some of these books are the textbooks used in this seminary. Where else are you taught by the actual authors of the textbooks? (Amazon.com) All of the books Dr. Klein has written, thoroughly cover each topic. ATS professors are called by Jesus Bible teachers, Ephesians 4:11. Plus, Dr. and Sister Klein teach Biblical Aramaic, Greek, and Hebrew. A real Bible professor needs to know Hebrew, Aramaic, and Greek! They need to be able to read the Holy Bible. Apostle Paul didn't write the Epistles in English. You are welcome to call each number at a reasonable hour. The Kleins have published over 26 books. A few of these books are available at Amazon and Barnes & Noble. Matthew, Mark, Luke, John, Acts, Romans, 1 Corinthians, Revelations, Ephesians, Colossians, Galatians, Jude, Peter, etc. NOTE: Apostolic Theological Seminary no longer has schools overseas.